treehugger.scala is a library to write Scala source code programmatically. It's also an implementation of Scala AST based on Reflection API, now available from github eed3si9n/treehugger. I've expanded this into a complete guide using awesome n8han/pamflet. Scala the language is one of the most elegant, expressive, consistent, and pragmatic languages. From pattern matching to the uniform access principle, it got so many things right. And Scala the ecosystem and Scala the community only makes it better. 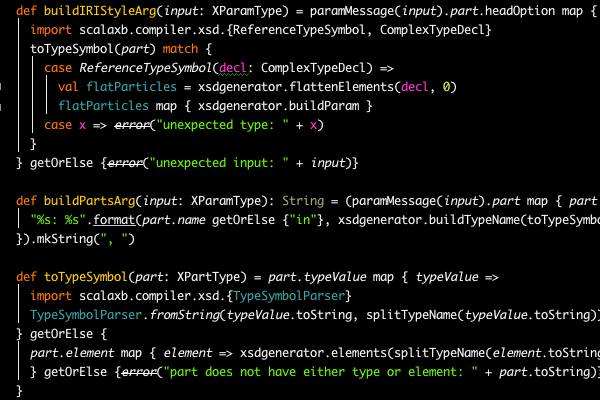 In Scala 2.9.1, locally declared implicits are preferred over imported ones. The problem is that the spec does not cover such behavior. My original hypothesis was that either I did not understand the spec correctly, or the spec was wrong. Based on the assumptions, I set out to explore the implicits resolution precedence last week. Like MythBusters say, the best kind of result is when you get something totally unexpected. It turns out that both of the hypotheses were wrong. Northeast Scala Symposium 2012 is coming up in a few months, but I want to revisit a talk from this year's nescala to wrap up 2011. One after the other, nescala had amazingly high quality of talks. You can check them all out here. With Daniel's Functional Data Structure and Jonas's Akka each having an hour-long key notes, the symposium left an impression on me that actors and FP are two major forces within Scala community. (Paul declaring that sending messages to actors is not referentially transparent was a hint too, I guess) There were also earlier signs of how the year turned out, like Mark's sbt 0.9 presentation and Nermin's Scala performance consideration. One talk that stood out in terms of immediate impact to change my code was Josh's talk: Implicits without the import tax: How to make clean APIs with implicits. Just wanted to share a few techniques of everyday coding using some of the Scala tools. Suppose you're developing a tool or a library, and you get a bug report. My first focus, before I start analyzing the cause, is to reproduce the issue using the same data the user is using. Once the issue is reproduced, then you can move on to simplifying the issue into a failing spec or functional test. Once the bug is fixed, you can then use the same setup to confirm the fix using the real data. If you've just landed from 0.7 world, sbt 0.10 is overwhelming. Take your time to understand the concepts, and I assure you that you'll get it in time, and really love it. There are three ways you may interact with sbt 0.10, which could be confusing at first. shell, which you get when you start sbt 0.10. Quick Configuration DSL, which goes into build.sbt or in settings sequence. good old Scala code, aka Full Configuration. Let's talk about testing. Once you write a plugin, it turns into a long-term thing. To keep adding new features (or to keep fixing bugs), writing tests makes sense. But how does one go about testing a plugin to a build tool? We fly, of course. I wish there was a common super trait for various future implementations in the standard library, so I can express the concept without tying the code to a specific platform stack. I am not sure if there are others who feel the same, but I think it would be useful for library authors. That's my motivation of writing sff4s. You've probably come across the notion before but let's go over it quickly. A future value (also known as promise) represents an incomplete calculation. On 7/13/2011 I hosted a ny-scala meetup on sbt 0.10 migration with doug tangren and rose toomey. Here is the slides.